Green plants, algae and some bacteria use sunlight as a source of energy. Plants and algae have chloroplasts for this. These are special parts of a cell (organelles) filled with membranes and in which the primary processes of photosynthesis occur. Two protein complexes, called photosystem I (PSI) and photosystem II (PSII), are responsible for the initial steps of this process in which energy is absorbed from sunlight. They work together with several other membrane proteins to convert the absorbed energy into the energy-rich molecules ATP and NADPH. These can convert carbon dioxide into carbohydrates and other substances. Both photosystems, PSI and PSII, are complex machines made up of dozens of subunits. Together these components bind several tens to several hundreds of pigment molecules, of which chlorophyll is the most important component. One part of the subunits of PSI and PSII are antenna proteins. These ensure that sunlight can be absorbed efficiently. The antenna proteins quickly transmit the energy to the reaction centres where the energy causes the charges to separate. This constitutes a major step on the way to converting solar energy into a chemical form. The plant is able to regulate PSI and PSII. This is vital for getting rid of excess sunlight so that it cannot cause damage. The plant can also ensure that a part of the antenna proteins transfer energy to PSI or PSII, dependent on the spectrum of the incoming light. A multidisciplinary approach is needed to understand photosynthesis at the molecular level. This includes the use of advanced spectroscopy, structural studies with electron microscopy, and detailed biochemistry and biophysics studies. A team of researchers within this programme is busy unravelling several aspects of photosynthesis in, for example, the model plant Arabidopsis thaliana or the green alga Chlamydomonas reinhardtii. 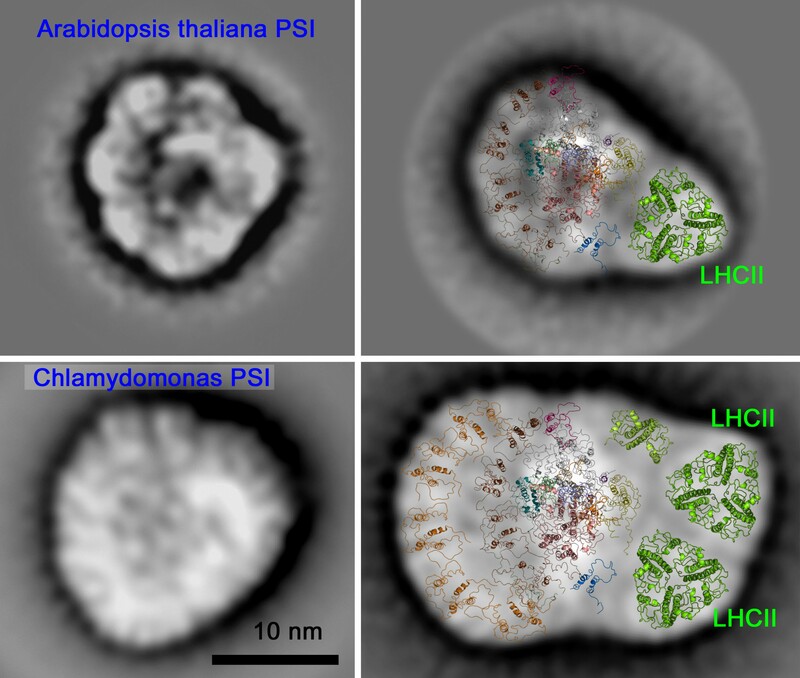 In 2013, researchers produced the first structural maps of how the antenna of PSI is expanded with two LHCII proteins (light-harvesting complex II) in Chlamydomonas. An overview of the complex machine of photosystem I (PSI) in Arabidopsis (top) and Chlamydomonas (bottom). On the left are the structures of proteins without an extra antenna. On the right are the structures that arise if PSI binds to an extra antenna. The two-dimensional projection maps were obtained using electron microscopy and image processing, with modelling of the components. The LHCII Proteins (light-harvesting complex II) are mobile components that can bind to both PSI and PSII.